Seacoast United recently donated soccer balls and t-shirts to Honduras Hope, a non-profit organization dedicated to supporting rural poor and politically marginalized communities in Honduras. The soccer balls and shirts had quite a journey to reach the kids of San Jose De Machegua: They started out in N.H., were driven to Boston, flown to Miami, then to San Pedro Sula where they were loaded onto a truck and driven 3 hours through city of Yoro, Honduras and into the small Tolupan village of Plan Grande. They were packed onto mules for a three hour climb to San Jose, a small village that sits high on a mountain top where roughly 450 people live in extreme poverty. It is a community of squatters who have no title to their land. The people of San José suffer with many struggles such as no electricity, leaking roofs, dirt floors, parasites, water and latrine issues just to name a few. Honduras Hope has built a primary school in San Jose, funds a health care clinic and feeding program. Prior to our help the children of San Jose attended school up to 6th grade. Honduras Hope built a boarding house in Yoro, which enables 26 of the San Jose children to live in the city where they can continue onto high school and even college. When we arrived to the village the children ran to greet us. The first thing they ask for on each and every trip is for soccer balls! Soccer balls are a real treat for children who usually wrap up plastic bags to make their own. 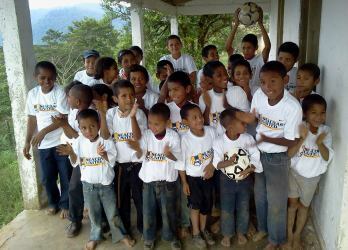 Soccer is the sport of Hondurans! This trip was extra special for us and for them due to your wonderful donation. It is hard to even put into words how much this meant them. The kids surrounded the clinic gate and with each soccer ball that was distributed, you could hear the cheers erupting throughout the village! The t-shirts were almost as exciting. It is very rare the kids ever get anything new, and to have all matching “soccer shirts” really made them feel like a team. 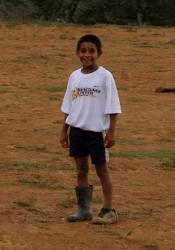 It was a powerful moment to see them all in uniform running in bare feet or old mud boots down to the red clay soccer field. I know for me it is a moment I will never forget. To learn more about Honduras Hope, visit their website here, and be sure to visit their Facebook page. To learn more about Seacoast Uniteds KickBack program, click here.